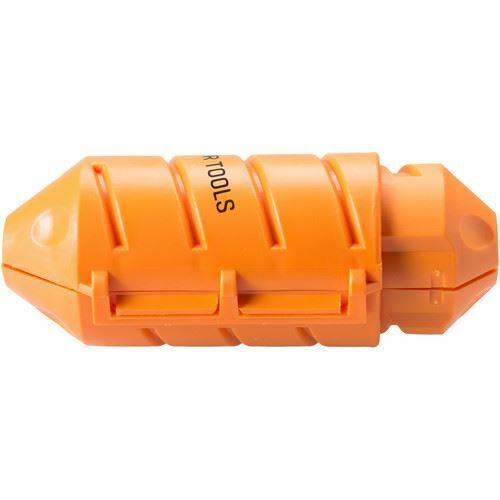 The orange JS026ORG JerkStopper Extension Lock from Tether Tools is an effective locking device for cables and cords that keeps your cable ends protected from disconnects, damage, and electrical hazards. It can be used in applications for photo shoots, computers, studios, and more. The clam-shell design enables you to close the JerkStopper Extension Lock around each end of a cable or cord and then twist to lock the cords together. It is compatible with USB extension cables, HDMI cables with couplers, and power cords for lighting and tools. In addition, the hard plastic protective casing is weatherproof (not submersible) and protects cables from dust, dirt, and physical damage. Box Dimensions (LxWxH) 5.2 x 3.2 x 1.2"